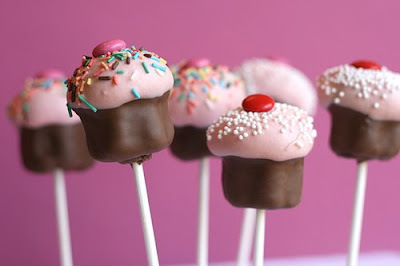 You've seen these cupcake pops from Bakerella right? If you haven't, go there and look at them for yourself. I was at a church function this weekend and a girl made these and I was so excited to finally get to try them! And I'll tell you, they are absolutely delicious. I didn't know anything so adorable could be so tasty. I'm happy to say then can. Ah! Love these! The presentation would look so amazing as a centerpiece as well. yes yes yes! my friend and I made some in July. They are time consuming, but tasty! Wow! That picture took away all my desire to go running and made me just wanna indulge in sweets! Yikes.